A seat at the PokerStars World Championship of Online Poker (WCOOP) valued at $1,050 is on the block at online poker penny auction site Bidibot.com. The seat for Tuesday the 21st poker tournament will be auctioned on Sunday 19th September and if the recent GUKPT seat that went for $16.03 last week is any indication, it could go for pennies. With a guaranteed prize pool of $50,000,000, this year’s WCOOP event is bigger than ever and now players have a shot at it for a discounted price. The 2010 WCOOP will run 62 events, including three High Roller tournaments, and will conclude with the No Limit Hold’em Main Event, with a guaranteed prize pool of $10,000,000. 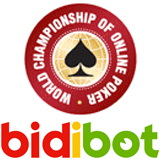 In Bidibot’s continuous online auctions, poker players bid on poker credits at their favourite online poker rooms like 888.com, VictoryPoker and Betfair placing as many one cent bids as they like until the auction is over. Each new bid adds another 30 seconds to the countdown timer until, sometimes after some fast and furious bidding in the final moments, $10 – $200 poker credit packages routinely sell for just a few dollars.